MissionPREP: Preparing for life in the Philippines! MissionPREP: IMPACT – Over the past week and a half we have had the privilege as a family to participate in a course known as MissionPREP. This 2 week course is designed to help families who are preparing for cross-cultural ministry in various places all over the world. There are over 40 people in attendance (adults and children) from all across Canada and the United States. It has been a wonderful experience for our entire family. We have laughed, cried, pondered some very tough questions, made wonderful friendships, and we have been affirmed over and over again in our calling to serve G od in the Philippines. This course is one of the final steps in our pre-departure preparations for life and ministry in the Philippines. What seemed like a long way off is now only a few months away. Some of the topics we have discussed include: Saying Healthy Goodbyes, Stages of Transition, Dealing with Grief and Loss, Staying Healthy While Living Overseas, Helping our Kids Adjust Well, Moral Purity, Team Building, Spiritual Warfare, and so much more. A couple of days ago, we had the opportunity to learn from all the kids. During their program (which is the same as ours only age appropriate) they learned about the stages of transition that everybody goes through when moving to a new culture. 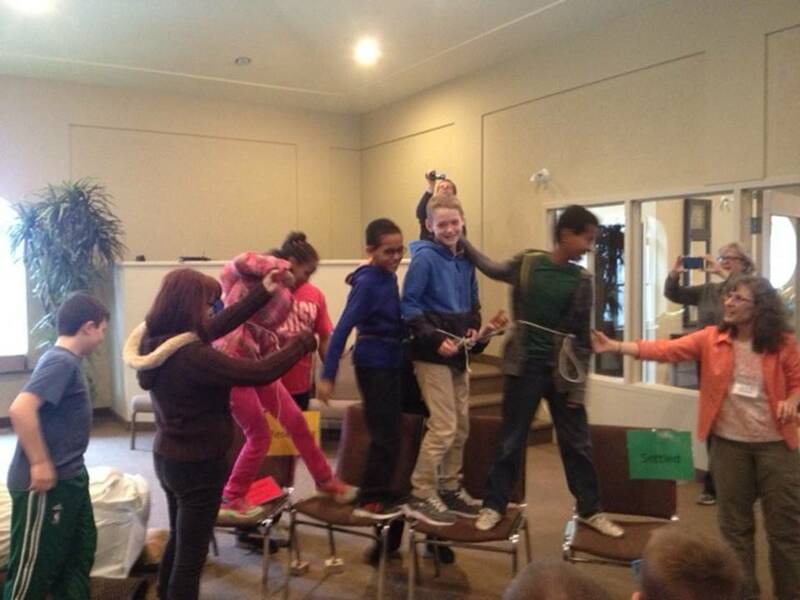 The kids demonstrated each of the stages using a Transition Bridge made of various part (chairs, bouncy balls, etc…). This was a very effective way of demonstrating to each of us the various stages that we will each go through as we adjust to a new culture. Allie had the joy of being the first kid to show us the various stages of transition – she was so proud! There is so much that we could share about these two weeks, but it would be far too long (and you probably wouldn’t read it all). So, we thought that we would each share with you one highlight from our time here at MissionPREP. Honestly, I could tell you about many experiences that have stretched and touched my spirit over the last few weeks because I am convinced that my heart and life have been forever changed. It’s the people that have enriched my spirit the greatest and God has used them to make a lasting impression. I love people and I am amazed at how intricate our God is in creating each person in a unique way. Their wisdom, experience, kindness, vulnerability, faithfulness to our King, grace, intelligence and humour have made a lasting IMPACT. Actually, those of you that know me realize how much I love and appreciate the human soul. It’s been a blessing to encounter individuals that understand our families journey on so many levels. It feels like I have known most of them my entire life! The families that participate in MissionPREP come from all over North America and they’re being sent by various organizations to countries all over the world. The truth is some of us may never see each other again and that saddens my heart because of how close we have become in such a short amount of time. The anxiety, grief, fear and passion to serve God has propelled us to be in this place and has empowered us to “go into all the world to preach the gospel to all people.” (Mark 16:15) I have come to a place of better understanding and appreciating that rich and divine calling on our lives. Also, I’ve come to a place of desiring to seek after the Lord in new and vibrant ways. It’s truly a privilege to serve God in this capacity knowing that “he’s gone before us.” (Deut.31:8) I cannot wait to hear from my MissionPREP friends and what our great God is going to do through them in various parts of the world as we keep in touch over the years. I could say so much more… Most importantly, I truly want to thank the Lord for this experience and all of you for supporting us on this incredible journey! On Tuesday afternoon, we had a guest presenter named Nouhoum Coulibaly. Nouhoum is from Mali, Africa and moved to Canada a number of years ago to study a Masters of Divinity at Tyndale University. Nouhoum has also served as a missionary in Senegal, Africa. Nouhoum talked to us about the suffering that we will all be exposed to in the lives of others (and in our own lives) as we face our overseas ministry. He talked about how our tendency is to want to avoid suffering or to try and fix it. That is certainly my default behaviour. Nouhoum shared with us from the life of Jesus and how he embraced suffering for us; that because of his suffering we are healed and given new life in Christ. He also shared that we are to share in the suffering of Christ (Romans 8:17). Suffering is not easy to embrace or to endure, but I pray that with God’s help, we will be able to share in the suffering of those whom God brings into our lives as we share the hope of the gospel! Thank you so much for your continued prayers for our family! These two weeks have been so good for our kids. Each evening we have had opportunities to talk with them about what they are learning and how they are feeling about our upcoming transition. They certainly have their fears and anxieties about life in the Philippines, but they have each admitted that these two weeks have helped them process their feelings and encouraged them to put their trust in God. We would love to have you become a Partner-in-Mission with us! We are only able to follow God’s leading in our lives thanks to the monthly support of generous individuals. If you would like to become a monthly supporter please contact Barb Keys (bkeys@cbmin.org or 1-905-821-3533) at Canadian Baptist Ministries. You can also visit their website at www.cbmin.org to give online or for more information.